On my my journey with clean eating and getting health I’ve (re)discovered yogurt. But not the flavored, sugar laden yogurt, I’m talking plain yogurt. Yuck. Right? No! 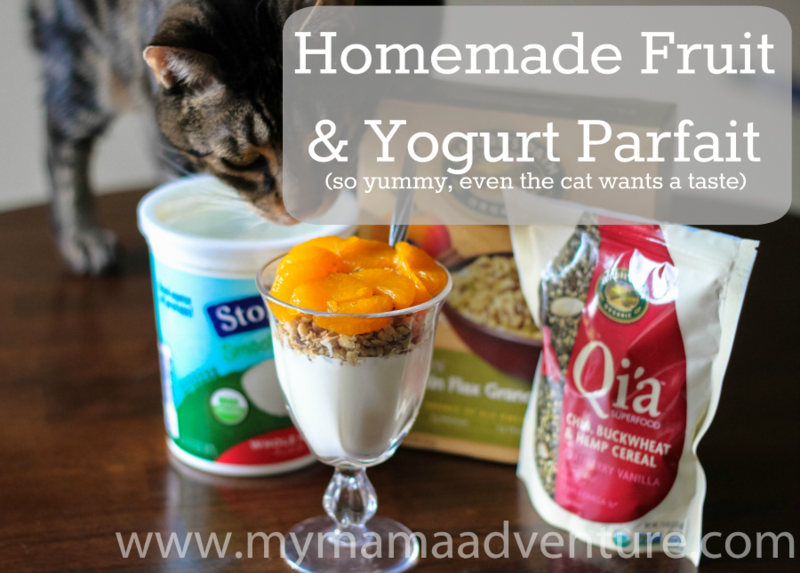 I have found many ways to make plain yogurt taste yummy. Adding peanut butter and cinnamon, pumpkin and pumpkin pie spice, and recently making my own fruit and yogurt parfait. When Nature’s Path sent me a box of their Pumpkin Flax Granola and Qi’a Superfood Cereal, I knew exactly what I was going to do with it! I was going to recreate a fruit and yogurt parfait that I would get almost daily when M was in the hospital. But this time, I’d know what ingredients were going to be included in the parfait. Oh, and yes, you read that correctly PUMPKIN granola!! Perfect for this time of the year when everything is pumpkin. My favorite!! Here’s my (super easy) fruit and yogurt parfait recipe, are you ready? It’s really easy! Put some plain yogurt into the bottom of your bowl (goblets of course make everything more fun), add some granola and qi’a, then top with mandarin oranges. Dig in! I love using the Nature’s Path granola and cereal because the Pumpkin Flax Granola is delicious and crunchy blend of oats, pumpkin seeds, flax seeds, cinnamon and molasses. The Qi’a Superfood Cereal (pronounced “key–ah”) is a gluten free Superfood Cereal that combines Chia seeds, Hemp and Buckwheat and is full of Plant-based Protein, Fiber & ALA Omegas. And, of course, all of Nature’s Path products are certified organic and Non-GMO Project Verified. Help me in my clean eating journey and comment below with your favorite healthy snack! Previous PostJump Start Your Business With Shutterfly #StonyfieldBloggerNext PostHow Can I Help You Feel Loved?